Secrets of Willow House by Susanne O’Leary is a contemporary romance that unfortunately a lot of ladies may relate to. Who hasn’t felt a bit stressed and overworked in their lives? Who hasn’t let those relationships with various family slip away as there just doesn’t seem to be enough time for everything? When Maeve begins to feel rundown and overworked she makes a trip to the doctor only to be told she needs a holiday now or her health may be in danger. Working in interior design Maeve has clients contacting her at all hours with demands and a boss that won’t turn any new business away so she’s not at all surprised with the news. Perhaps it’s coincidence or maybe it’s fate but just as Maeve’s planning to travel back to I Ireland to rest and relax she gets a call from her aunt Philomena asking for help and knowing it’s been far too long she happily agrees. Maeve quickly finds herself feeling at home being where she grew up and what she and her aunt find surprise them both. 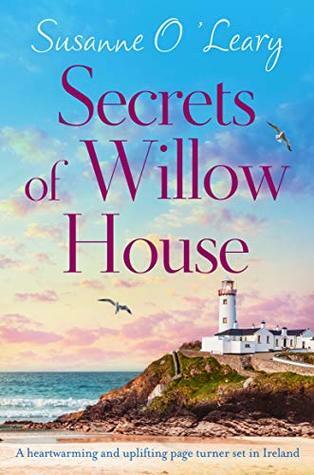 Secrets of Willow House was a charming little read that while I did not grow up in such a lovely setting I did relate with Maeve being so stressed and needing to reconnect with family and this side of the story is just as charming as adding in a bit of romance. The lovely seaside Irish setting just made this one all the more relaxing and enjoyable to read too. Wonderful review Carrie. This one sounds delightful and quite fitting that this is Read Ireland month. I will have to check out this author.